Bamboo and Me – what will we do together? Visual: Me skipping through the meadow holding hands with my new Bamboo, sun rays shining in a burst, lovey dovey music playing. Well that’s how I feel right now! Super yummy inside and warm all over. 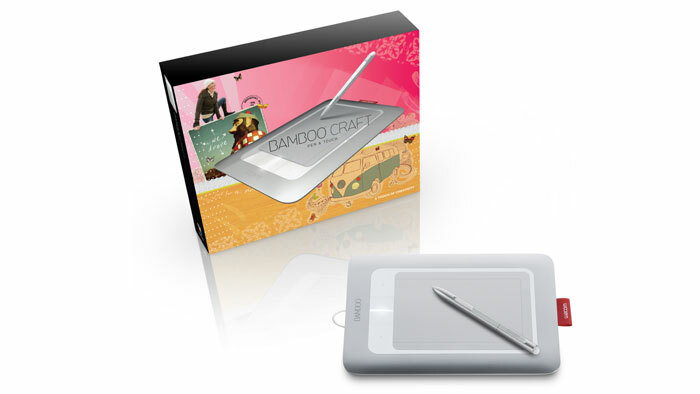 Thank you Wacom for the Bamboo Craft Tablet. I am forever drawing on paper then scanning it in and then manipulating it. Today I was given a Bamboo Craft Tablet to see what I can make happen. The folks over at PenScrappers.com are using this little yummy enforce. I can’t wait to see what I can do with it. Stay tuned . . . . . . Cue: sickly sweet music. Disclosure: Wacom Company provided me with this product free of charge to use in any manner I desire for my craft, art and design projects. This entry was posted in creative and tagged Bamboo, Drawing. Bookmark the permalink.